Stock Transfers. IRC Section 382, post-TCJA, affecting stock acquired by divorce or separation instrument. All three definitions of divorce or separation instrument are available for the transfer of stock with a carryover basis, which given the repeal of the alimony deduction post-2018 provides for planning opportunities for spousal support settlement that would not have been possible under the “cash” requirement for deductible alimony under pre-2019 Section 71 of the IRC. Sale of Principal Residence. IRC Section 121, post-TCJA, dealing with the exclusion of gain from the sale of principal residence post-2018 under TCJA. All three subparagraphs of divorce or separation agreement qualify for an instrument permitting the gain exclusion of qualifying sale of a principal residence up to $500,000 on a joint return and $250,000 on a separate or single tax return. Frequently, persons who were married must sell a residence they owned jointly in a divorce. The exit plan for the sale of the residence is quite strategic given section 121 of the IRC. How much is at stake? $250,000 of gross income gain for qualifying taxpayers and up to $500,000 for certain qualifying joint filers from the qualified sale of their principal residence once every two years. The principal residence that is sold must be owned and used as the principal home by the sellers for periods aggregating two of the five years immediately before the sale. The big caution is that there are use and ownership requirements and a spouse’s sole use of the marital home before the entry of the proper divorce instrument is not imputed to the other spouse. With a proper divorce or separation instrument, the use period is tacked together. Be Careful: A spouse’s sole use of the marital home before entry or execution of the divorce or separation instrument is not imputed to the non-occupant spouse for purposes of section 121A or 121B2. Thus, the timing of spouse’s departure from the marital home could be critical from the standpoint of Section 121, depending on how long he or she already lived in the house and how long after the entry or execution of the divorce or separation instrument the parties intend to sell the home. Sections incorporating only subparagraph (i) of the definition of divorce or separation instrument Post-2018. Having IRA subject to only this first subpart creates not only confusion, but is also unjustified coming from the archaic era where some were reluctant to include IRAs of any sort as marital property. Of course, perhaps we don’t want to be transferring large retirement assets pursuant to a fraudulent separation? (Or do we care, given the expansion of the estate tax rules, a topic for another day?) Stock can be transferred under a written separation agreement, so why not IRAs? A QDRO under IRC 414(p) has a very different definition of a State Domestic Relations, which could easily be adopted for the definition of an instrument for an IRA transfer. From this tax and family lawyer’s perspective, these distinctions between an IRA and a 401(k) division is divorce makes no policy sense. A residence can be transferred for use under a written separation agreement, so why no IRAs? These meaningless distinctions need to be examined and simplified. Like IRAs, these can only be transferred in a divorce or a separation pursuant to subparagraph (i) decree or agreement. These sections also now utilize the definitions in Section 121(d)(3)(i). The loss of the ability to contribute to an IRA out of alimony. An IRA owner cannot deduct for payments to an IRA more than the amount of his or her taxable compensation. Pre-2019 alimony under section 71 was included as compensation for purposes of determining if an IRA contribution can be made. 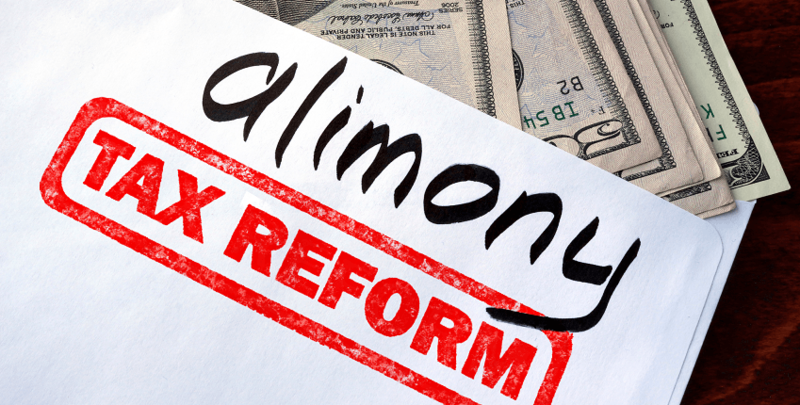 TCJA eliminated alimony as within the definition of compensation for divorce or separate maintenance instruments executed after December 31, 2018, so IRA deductions cannot be made from the non-taxable alimony post-2018. TCJA strikes the sentence: “the term compensation shall include any amount includable in the individual’s gross income under section 71 concerning a divorce or separation instrument described in subparagraph A of section 71(B)2.” That sentence is stricken under section 11051 of the TCJA.